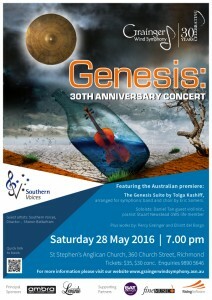 This is a free concert in a wonderful auditorium at the school, Penleigh and Essendon Grammar School in the HR Stevens Auditorium, enter off Rachelle Road, East Keilor. 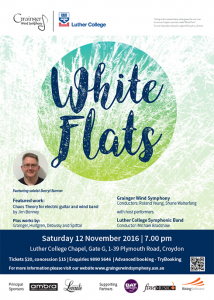 Click here to read program notes for the items being performed by the wind symphony. For a list of concert dates, please move your mouse to the word “Concerts” and select the Concert Series Calendar for 2016 in the pop-down menu for the calendar or click here. All concert bookings can be made through TryBooking.com, a web based booking site we use. The particular event will usually be open about one month prior to the event. Go to the TryBooking page for a particular concert your are interested in, go to the page on this website for the particular concert and you will see a link to our concert page in TryBooking. This is easier than going into TryBooking and using their search engine to find our concert. The Grainger Wind Symphony, a not-for-profit wind symphony performance group founded in 1986, is kicking off their 30th Anniversary year with five brand-new Australian compositions. 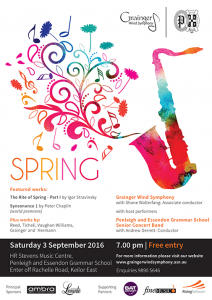 Continuing their popular Made In Australia series, The Grainger Wind Symphony extend an open invitation to enjoy an evening with us. Let us colour your first week of Autumn in an intimate setting, just a short walk from Richmond’s culinary culture. Members of the band will also premiered Andrew Harrison’s Clarinet Quartet. The program also included a performance by guest artist Konrad Dorecki; and published compositions by other Australian composers Scott Cameron, Percy Grainger and Barry McKimm. 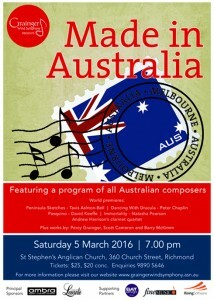 Featuring conductors: Roland Yeung, Shane Walterfang, David Keeffe and Peter Chaplin.